Rachel Kroh's rustic camping scene suggests that home is about a person, not a place. Home is wherever your love lies—even in a cozy, two-person tent. This rustic camping scene by Rachel Kroh suggests the sweet idea that home is about a person, not a place. Based on Rachel's original hand-carved woodblock prints, this image is printed on an Indigo press, a digital process that creates vivid, matte prints that are remarkably true to the original image. 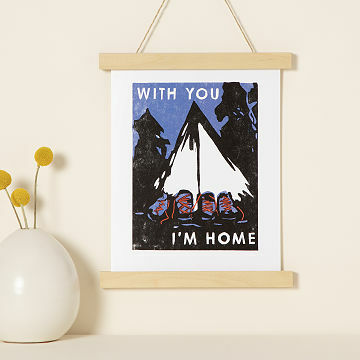 This romantic art makes a great gift for amorous adventurers and outdoorsy couples. Made in Indiana. This was a great camper van/housewarming gift for my boyfriend (despite there being a tent in the picture). We liked the rustic feel and it got the sentiment across that I was hoping to- we can be home together anywhere, even in a small space. Had it framed and matted with an orange that matches the shoelaces - really made it stand out and look nice. One our first dates was a group camping trip. We've been together 34+ years now. Fit perfectly in an 8x10 frame. A very beautiful print with a simple but powerful message. The print and coffee mug warmers I ordered were exactly as they appeared online! The quality and clarity of the print was perfect. The mug warmers were of good craftsmanship. I found a great frame at a local shop and the look was complete! The print and paper are high quality and didn't even require framing.